Trade Show Magician - Lead generation & ROI is my business! Increase ROI with a trade show magician! Imagine attendees stopping in their tracks in front of your booth. 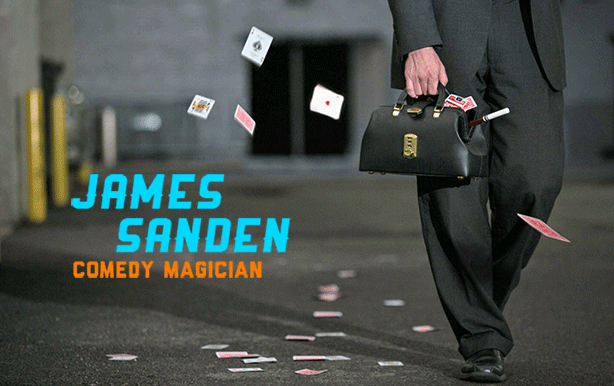 Then, by incorporating YOUR ideas in his script, trade show magician James Sanden gets your message across without the audience realizing it! He even includes qualifying questions in his script so that your salespeople know EXACTLY who to talk to. Trade show booth entertainment isn’t just about putting on a good show. In the business world content is king, which is why James’ customized performances integrate his background in communication, education, business analysis and marketing to insure your message is crystal clear, effectively communicated and extremely memorable. Your booth is expected to be productive, impactful and educational, while not being dry and boring. James makes this difficult task easy. By capturing your attendee’s attention with his high energy comedy, engaging their mind with his astounding magic and incorporating your message in the performance, you’re guaranteed an effective, memorable and entertaining product presentation everyone will love. Contact James for a no-cost proposal today!